Premiere Jazz Band in the greater Los Angeles area. Special Memorial Day Concert, May 25 at the San Fernando Valley Arts and Cultural Center. Big Band Jazz at its Best! Come have a listen live in Los Angeles or on this site! Rave reviews for this talented group of musicians. Angel City Big Band for your next event! Angel City Big Band has performed at events both large and intimate. The Angel City Big Band was founded in 2010 by baritone saxophone musician Tim Miller. Tim's father, a gifted jazz trumpeter and band leader encouraged Tim to perform from a young age with his big band. Herm left all of his precious jazz charts with his son. With this amazing legacy, Tim took the opportunity to establish the Angel City Big Band. You can find the Angel City Big Band performing at the American Legion Hall on Fallbrook Avenue in Woodland Hills on the 2nd Saturday of each month. Dinner and dancing while the Angel City Big Band provides the music is a great way to spend a Saturday evening! Night at the Center at the San Fernando Valley Arts and Cultural Center, 18312 Oxnard Street, Tarzana, CA 91356 on 05/25/2019 from 7:00 pm - 9:00 pm. 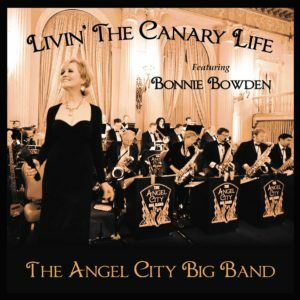 A singing and swinging delight is songstress Bonnie Bowden's reunion with her pals The Angel City Big Band in their CD "Living the Canary Life." Ms. Bowden and her orchestral cohorts are famous for keeping the torch burning for the great dance bands of the 1940's. With this CD you can either sit back and finger=pop your enjoyment or kick up your heels and dance to jazz takes on classics like Irving Berlin's "How Deep is the Ocean," Jerome Kern's "All the Things You Are" and Duke Ellington's "Do Nothin' Til You Hear From Me." High Spirits and wry humor fuel this CD especially in its title song, "Livin' the Canary Life," which Ms. Bowden renders beautifully with up-front-and-personal understanding. Cab Calloway, the revered big band leader of the 1940's, coined the term "canary' to mean a female singer in a jazz orchestra singing or "chirping" nightly as she and the band endure the rigors of traversing America. Ms. Bowden having toured the world with Sergio Mendes' bossa nova combos, knows the ordeals of travelling from one city to another to perform. There's good reason for her to honestly lament in this song's lyric that the grind is enough to make a canary "hate her agent' for booking those one-night stands in the boondocks of Hoboken and Riverdate ... Arthur Hamilton's insightful lyric states "a wedding band" would be preferable -- but until then, this canary will be "singin' on the band stand, til the band is gone" ... And in the song's finale, Ms. Bowden musically hames the iconic canaries Anita O'Day, Peggy Lee, Lena Horne and those super talented female big band singers of which she is surely one of the best. Lyricist Arthur Hamilton and Ms. Bowden again make a great twosome with his lyric on "Cry Me a River." This song has been a tour-de-force for Bowden and in this CD's rendition The Angel City Big Band provides a bluesy arrangement just right for Bowden's rendition of romance gone awry. Broadway gets its just due when Ms. Bowden spreads her wings on Broadway songwriter Frank Wilhorne's "Til You Come Back To Me." Bassist Dustin Morgan kicks the band into thunderous gear, RW Enoch's tenor sax soars, and in matching the excitement of both, Bowden goes stratospheric at the finish. Lest' The Angel City Big Band be thought of as only honoring the swing tunes of yesteryear, their take on modern jazz great John Coltrane's composition "Giant Steps" is a gas. Rolling Stone Magazine sited Trane's "Giant Steps" as one of the 500 Greatest Albums of All Time. The Angel City Big Band does its own thing with the number from percussionist Jack Cook's thunderous opening in an arrangement that often evokes the Woody Herman Band and its sax section playing "Four Brothers." Very fine listening. It's ideal when a CD has a beginning, middle and end. "Livin' the Canary Life - featuring Bonnie Bowden" is always progressing from the outset, and its finale is perfect. The composer/lyricist is the revered Cole Porter -- the arranger is Sammy Nestico from the Count Basie era -- and the tune is "From This Moment On." Ms. Bowden joyously chirps You and I babe / We'll be ridin' high babe / Every care is gone / From this moment on. Indeed -- ride high babe and enjoy this CD! 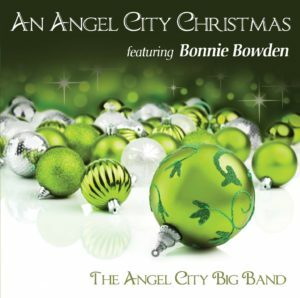 The Angel City Big Band featuring BONNIE BOWDEN is a straight-ahead, swinging Los Angeles area big band. Their delightful new album, Livin' the Canary Life (Self-Produced by founder/baritone saxophonist Tim Miller and Audio Pro/Producer/Engineer Bass Trombonist Jim Baldree) has a dozen selections with Bowden's vocals on eight of them. The arrangements are by the likes of Mark Taylor, Patrick Williams, John Clayton and Sammy Nestico. The star of the album is vocalist Bonnie Bowden. She has a lovely soprano voice that envelps each lyric with the kind of richness that sets the good singers apart from the pack. Dig her rendering of the hip title tune, a previously unrecorded gem with words by Arthur Hamilton and music by Patrick Williams, who wtore the chart, as he did for Bowden's fine take on Hamilton's classic "Cry Me a River." She also brings her special feeling to "Till You Come Back to Me," "I'm Gonna Live Till I Die," "You Are So Beautiful," "Do Nothin' Till You Hear From Me," "How Deep is the Ocean" and "From This Moment On." The band executes the charts with precision and warmth. They provide instrumental versions of "Swing, Swing, Swing," "All the Things You Are," "Gold Coffee" and "Giant Steps." Livin' the Canary Life is fun from start to finish, and those included toward cutting a rug will find this music perfect for that purpose. If you're looking for a collection of Christmas songs well sung and played in nicely crafted arrangements, this one meets your criterion. The arrangers include Tom Kubis, John LaBarbera and Ralph Carmichael, the singer is the unfailingly cheerful and gratifyingly in-tune Bowden, and the songs are all proven classics. If for nothing more than Bowden's astonishing high-register unison vocalese with the trumpets on "Let it Snow," this would be one of my new seasonal favorites. Over the years, I have grown tired of "Have Yourself a Merry Little Christmas" and "The Christmas Song," Nat Cole and Mel Tormé notwithstanding. Bowden and the Angel City crew of skilled studio craftsmen restored them for me. She does a great job with the verse to "What are you doing New Year's Eve."